Romelu Lukaku scored twice in the first half as the Red Devils - beaten by Brighton and Tottenham in their previous two Premier League matches - were largely untroubled by their hosts. Pogba had the chance to stretch United's lead midway through the second half but his penalty - after Aaron Lennon fouled Rashford - was saved by former Manchester City goalkeeper Joe Hart. That made the closing stages unnecessarily tense for Jose Mourinho's side, but the Clarets were unable to find a way through. Victory took United up to 10th in the table - level on points with Everton in seventh. The build-up to the match had been dominated by discussion of the Red Devils' stuttering start to the season. There had even been speculation Mourinho could be one game from being sacked. And the club's executive vice-chairman was the target of a banner that flew over the ground before kick-off reading 'Ed Woodward: A specialist in failure'. If the United players were feeling the pressure, they did not show it during a thoroughly professional first-half performance. Lukaku looked back to his clinical best when he rose highest to power home Alexis Sanchez's clipped cross after 27 minutes. And the Belgian reacted well for his second on the cusp of half-time, slamming the ball home after a series of kind deflections. But, with the game stretched in the second half, he failed to complete a hat-trick - squandering the best chance after rounding Hart under pressure from Ben Mee. 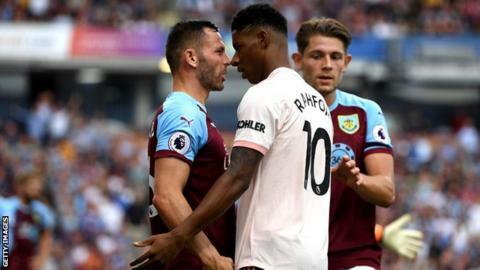 Rashford, who had won the penalty shortly after coming on, then lost his cool in an altercation with Bardsley and was shown the first red card of his career. More pleasingly for Mourinho, his defence - again changed from the previous match - looked solid, keeping United's first clean sheet of the season and a 10th in their past 11 visits to Turf Moor. A second home defeat of the season leaves Burnley 19th in the table with just one point taken from their opening four matches. They offered little throughout, perhaps affected by their Europa League exit to Olympiakos on Thursday. Even after going behind, Sean Dyche's men seemed reluctant to attack United, and teenage winger Dwight McNeil had their only shot on target in the opening 45 minutes. Dyche attempted to give his side more impetus by bringing on Sam Vokes on 58 minutes, and the Wales striker forced United goalkeeper David de Gea into two good saves. But the Spaniard was not tested enough and Burnley are now without a league win in nine games, a run stretching back to April, meaning they are on the longest winless run of any side in the competition. The international break gives them a chance to regroup, while their exit from the Europa League at least allows them to focus solely on domestic matters. But Dyche will not be looking forward to January's return fixture - after eight attempts, he is yet to beat Mourinho in the Premier League. Manchester United manager Jose Mourinho speaking to BBC Sport: "Burnley played very well as a team, and there were very good individual performances and we should score many more goals. The result shouldn't have been open until the last minute." On Pogba's penalty miss: "I never blame a player for missing penalties. I blame the ones who refuse to go up there. Paul's scored some good ones for us." On Rashford's red card: "I don't know what happened. I would say it was naive. It was a kid and a very experienced man. Bardsley's been in the game for 20 years and Marcus is a naive boy." Burnley boss Sean Dyche speaking to BBC Sport: "Disappointment is quickly thought about in the same process as the reality. Manchester United are a very good side - they started hard and fast with the ball and defended strong. "Sometimes there is balance to the disappointment. We got about them - the goal on half-time is a sickener for us. I thought Lukaku was excellent. It's a strange one because we come out of a useful period for experience but a tough period." Burnley have won just one of their past 18 top-flight meetings with United (D8 L9), with that victory coming in their first Premier League meeting back in August 2009 (1-0). Mourinho has won each of his four Premier League games at Turf Moor (P4 W4), including all three in charge of the Red Devils. United have won each of their past 24 Premier League matches in which they have scored the opening goal. Lukaku scored his first Premier League double for United since August 2017, when he did so on his debut in the competition for the Red Devils (v West Ham in a 4-0 win). Rashford became the first substitute to be sent off for the Red Devils in the Premier League since Marouane Fellaini against Hull City in May 2015. At the age of 18 years and 284 days, McNeil became the first teenager to start a Premier League game for the Clarets. Fellaini made his 250th Premier League appearance in this game. The only other Belgian to make as many is Vincent Kompany (251). After the international break, United travel to Vicarage Road to face Watford on Saturday, 15 September (17:30 BST). Burnley face Wolves at Molineux the following day (13:30 BST). Attempt missed. Matej Vydra (Burnley) header from the centre of the box is just a bit too high. Assisted by Ashley Westwood with a cross following a corner. Penalty saved! Paul Pogba (Manchester United) fails to capitalise on this great opportunity, right footed shot saved in the bottom left corner.